Over the last 10 years, top-notch courses have proliferated in this corner of the world. In addition to scenic landscapes and provocative cuisine, its balmy Mediterranean breezes and consistent sunshine make it a year-round golfer’s paradise. Courses include Spain’s Valderamma Golf Club, which in 1997 became the only club outside of the U.S. and Great Britain to host the Ryder Cup. For non-golfers, a full itinerary of historical and cultural excursions awaits. Highlights include a day exploring Granada and the magnificent Alhambra palace. And with 17 cabins accommodating just 34 guests, the private yacht Callisto is ideal for this itinerary. You’ll have the distinct sensation of being aboard your own private yacht, with good friends along for the adventure. Fly from the U.S. to Malaga, Spain. Arrive in Malaga and transfer to Callisto. Spend overnight aboard docked in port. GOLF: Enjoy the opening round of golf at Real Club de Golf Las Brisas. Near Marbella, our intimate group accesses Las Brisas, which hosted the World Cup of Golf in 1973 and 1989. This classic course is a great beginning to our golf in Spain and Morocco. TOUR : Take a full-day excursion to Granada, site of the Alhambra, palace-fortress of the 13th-century Nasrid sultans. With its splendid palaces, fragrant gardens, and spacious courtyards, the Alhambra represents the brilliance of Moorish culture, art, and architecture. Also see the 16th-century Cathedral and its ornate Royal Chapel. GOLF: Play Club de Golf Valderrama, the perennial #1 golf course in continental Europe. Cork oak and olive trees frame this majestic layout and give each hole a distinctive feel. Site of the 1997 Ryder Cup and notorious for the approach shot to the 17th green, Valderrama offers one of the world’s superlative golf experiences. TOUR : Ascend to the top of the Rock, visit Saint Michael’s Cave, and see Gibraltar’s famed tailless monkeys. Also travel to Casares, a typical Andalusian “White Town.” Wander around its twisting lanes and enjoy views from the Alcazar. GOLF: Enjoy the opportunity to play Tangier Royal Golf Club, Africa’s oldest golf course, located in an incredibly beautiful setting of hills and very mature cypress, eucalyptus, and pine trees. TOUR : Spend the afternoon exploring the medina and then visit the Dar el Makhzen, former palace of the sultans and now a museum of antiquities and crafts, as well as the Old American Legation, a former palace given to the U.S. government in 1777 to house America’s first embassy. GOLF: Dock in Casablanca and drive to Rabat to play Royal Golf Dar Es Salam Club, a glorious golf complex originally designed by Robert Trent Jones, Jr. for the late King Hassan II. 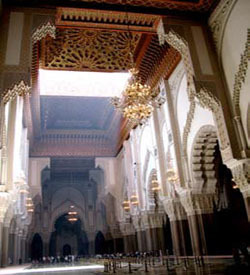 TOUR : From Casablanca, drive to Rabat, Morocco’s elegant capital. Tour its medina, home to colorful souks; the Chellah Citadel, which contains the royal tombs; and the Mausoleum of Mohammed V.
GOLF: Play El Jadida Royal Golf Course, recently listed by Golf Digest as the top golf course in Morocco. Situated close to the Atlantic Coast and designed by Cabell Robinson, El Jadida captures guests with its stunning natural beauty. TOUR : Explore El Jadida, whose old medina has a distinct Portuguese flavor from the town being held for over 250 years by Portugal. 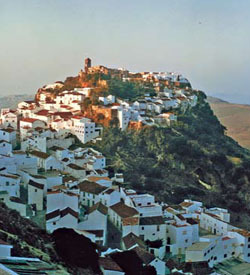 Nearby is the walled city of Azemmour, another Portuguese stronghold. From Safi, drive to fabled Marrakech, one of Morocco’s Imperial Capitals, founded in the 11th century and set among gardens and palm groves. 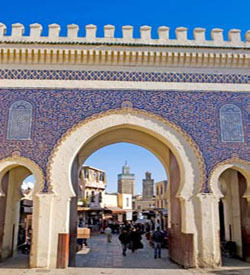 Our exploration includes the 12th-century Koutoubia Minaret; the Bahia Palace; the Ben Youssef Medressa; the Jewish Quarter; and Djemaa el-Fna, the city’s central square at the heart of the medina. There will also be the opportunity to walk through Marrakech’s colorful souks. Built around a sweeping bay, Agadir was first colonized by the Portuguese in the 15th century and was captured by the Saadians in the 1600s. Today it is one of Morocco’s loveliest and most vibrant coastal towns. 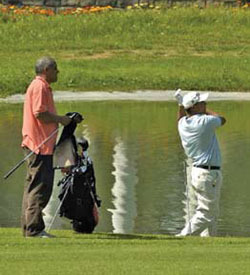 GOLF: Play at Golf du Soleil, situated between the Atlas Mountains and the Atlantic Ocean. Serene lakes and waterfalls scatter its three courses while shady fairways and ample trees make for an ideal atmosphere. GOLF: Play Teguise Golf Course. Built in 1978 by the British landscape architect John Harris, it is a smooth and varied course set at the foot of a volcano with extraordinary views of the Atlantic Ocean. TOUR : Call at Arrecife on Lanzarote, a UNESCO Biosphere Reserve and one of the seven islands of the Canary Archipelago. From Arrecife, visit the National Park of Timanfaya, whose landscape has been shaped by volcanic activity and is renowned for its distinctive plant species. Disembark in Las Palmas and transfer to the airport for return flights to the U.S.
10-night cruise aboard the 34-guest Callisto. Complete program of tours and excursions. Welcome and farewell cocktail receptions aboard ship. All meals aboard ship, including house wine, beer, and soft drinks with lunch and dinner. Open bar aboard ship throughout the cruise. Golf arrangements, including green fees and golf carts. Instruction and lectures by accompanying golf host and study leader. Professional Travel Dynamics International tour staff. Baggage handling and transfers abroad on the designated program arrival and departure dates. Gratuities to porters, guides, and drivers. Sail through the storied Strait of Gibraltar and play Club de Golf Valderrama, which hosted the Ryder Cup in 1997. Play the stunning Royal Golf Dar Es Salam Club, designed by Robert Trent Jones, Jr.
Visit the magnificient Alhambra in Granada, a masterpiece of Moorish architecture. Wander in the colorful souks and the lively Djemaa el-Fna square in Marrakech. Travel by jeep through the Atlas Mountains northeast of Agadir and visit the Berber village of Imouzzer. Marvel at the dramatic landscape shaped by volcanic activity on Lanzarote in the Canary Islands.